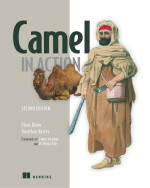 Camel in Action is complete! I had to actually search through my mail to find out when I started on this project. Turns out I got involved mid September 2009 which puts the time in about 15 months. Claus started before that so his month count is higher - poor guy ;) So it was a pretty big chunk of time for both of us but not too bad for a technical book I'm told. We set out to create something that the growing Apache Camel community needed badly - a great reference for newbies and experts alike. I'd like to think we accomplished that goal. Seems the early access readers agree too. I have yet to see anything other than a PDF copy of the book (which should be released tomorrow) so I'm really looking forward to when the print copies start showing up in 10 days! Now its time to celebrate. As Claus just posted, we are doing two webinars next month on Apache Camel at FuseSource. September 8th - Claus will give an introduction to Apache Camel including: core concepts, EIPs, components, and the community. 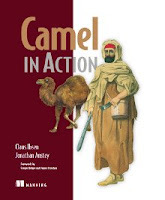 September 16th - I will go over deployment options for Camel including: embedded Java, Spring, ActiveMQ, ServiceMix (OSGi) and web app. This will include a live demonstration of deploying a Camel application in ServiceMix. These webinars are interactive so you can ask questions to us directly. Register here and drop in, it will be an interesting show! A pretty common thing I have to do is investigate issues that only occur when load is put on a system. Instead of hand coding message producers to pummel a Camel route or message broker, I've been using the Camel dataset component. I'm not sure many are aware of it but its an incredibly useful and easy to use tool. So this allowed us to quickly (1) set up a producer which sent 10000 messages, (2) consume those messages from the same queue and (3) report what the throughput was during the test. "There's a Camel component for that." Why these components? Well, we felt that these were the most widely used and thus essential knowledge for any Camel user. Of course, other components are covered elsewhere in the book but not in as much detail as these. Feel free to check out chapter 7 Understanding components in the latest book update or browse the chapters examples.